Having a hard time incorporating those healthy, green, leafy vegetables into your diet? Once you try this recipe for Sauteed Garlic Swiss Chard, it will no longer be an issue. We’ve all heard of the importance of including these green nutritional powerhouses in our diet. And you know what? It’s a lot easier than you think! Take for example Swiss chard. At breakfast, you can incorporate it into omelets or frittatas. It’s great in sandwiches and wraps for a quick and healthy lunch. And this recipe for sauteed garlic Swiss chard is great with a steak dinner, tossed around with pasta, in a quiche, or even in soups. I’m very fortunate to have it growing in my backyard. Nothing really compares in taste to freshly picked Swiss chard. It’s very easy to grow; and by removing only the outer leaves, it keeps growing, ensuring a constant supply all summer long. Once it is picked, it needs a good washing in order to remove the dirt and sand. Then, it gets a quick dip in hot water before being sauteed in garlic and olive oil. As you can see, I cut off the stalk – this is because it needs to be par-boiled for a longer period of time than the leaves. I will usually par-boil my Swiss chard on the week-end so that the final sauteing is effortless on a week-night. Would you believe me if I told you that there was never any shortage of green leafy vegetables in my youth? Maybe – after all, I’ve already shared with you how my mom would prepare broccoli-rabe. I’ve shared here a few pictures of what the garden in the backyard of my parents’ house used to look like. There was truly an abundance of spinach, mustard greens, rapini (Broccoli Rabe), collard greens, red and green leaf romaine lettuce and, of course, Swiss chard, also known as bietola. Italian Swiss Chard was definitely a weekly occurrence on the supper table. In the summer, it was fresh from the backyard garden. In the winter, it was from the freezer. We got our greens at every time of year! Doesn’t this bring the concept of clean eating to another level! This recipe for Sauteed Garlic Swiss Chard is a simple and delicious way to make sure you are getting those all important anti-oxidants and phytochemicals! ★★★★★ If you have made this Swiss Chard recipe, I would love to hear about it in the comments below and be sure to rate the recipe! Having a hard time incorporating those healthy green leafy vegetables into your diet? The solution is easy: Sauteed Garlic Swiss Chard. Simple & delicious. Meanwhile, thoroughly clean Swiss chard by rinsing out. Cut off stalks and set aside. Once the water has started boiling, throw in the stalks. Boil for 3-5 minutes until tender. Add the green leaves of the Swiss chard and continue to boil for approximately 2 minutes. Over medium heat, drizzle olive oil in a large skillet. Sauté minced garlic and crushed red pepper for 1 to 2 minutes. Add the drained Swiss chard and quickly cover your pot. Sauté for 3-5 minutes or until tender and heated through. If necessary add a few tablespoons of water. Place on serving dish and drizzle with olive oil and shavings of Parmesan cheese. I prefer my "bietola" chopped. While it is being sauteed, I use a scissor to cut it in bite-sized pieces. 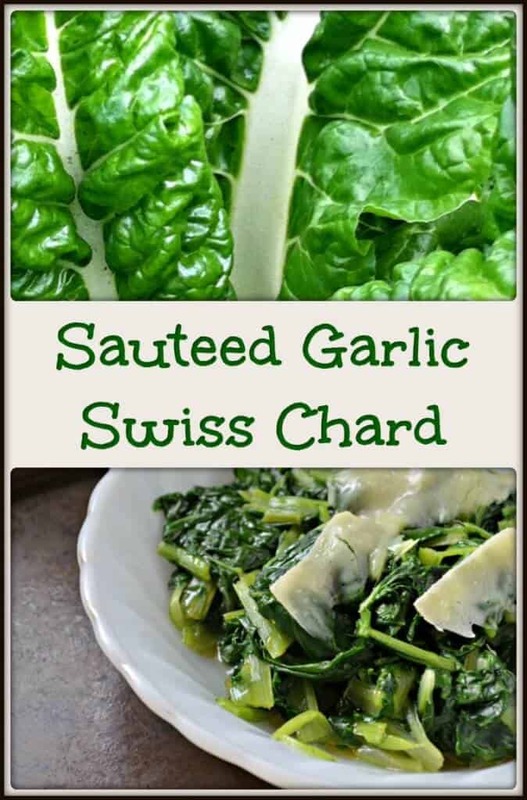 DO YOU LOVE THIS SWISS CHARD RECIPE? PIN IT TO YOUR VEGETABLE BOARD! I always try to have green leafy vegetables. This garlic swiss chard looks like it is such an easy recipe to make. Thanks for sharing! Appreciate your comment Angela, thanks!